We all know the routine, go to the doctors office, fill out the paperwork, get taken back by the nurse or medical assistant, GET WEIGHED, along with some other vitals like blood pressure. But why is this the way it is? Well for doctors to bill insurance they often need two/three physical measurements and weight, blood pressure and pulse are all relatively easy to take. But do they really need to know this information, and how is this different when you are pregnant? For starters, I would throw out that about 99% of the time doctors don’t really need to know your weight to give you effective medical treatment. There are definitely a handful of reasons a doctor may need your weight like if they are providing you with a new medication that is dosed based on weight, putting you under anesthesia, or treating your for a medical condition that could cause severe fluid retention that can be assessed by weight changes. Most of the time though, they really don’t need it. Pregnancy is another one of those times where weight is often used to assess your health and the health/growth/development of your baby. In these situations, it is important that your weight be assessed, but that doesn’t mean you need to know what the number is or talk about the number with your providers. What would be the benefit of NOT knowing your weight throughout your pregnancy? Pregnancy can be a trying and emotional time, hormones, poor sleep, and the unknown of what life will be like once your little one arrives. Not to mention that your body is changing, A LOT! Some individuals may have no problem knowing their weight throughout pregnancy, but for others seeing the number on the scale change could lead to increased stress, anxiety, negative self-image, and potentially even the development of disordered eating or eating disorders, and you never know how it will affect you. Even if you have never struggled with negative body image before, you may still experience negative body image through the changing body during pregnancy. Those who have a previous history of anxiety or depression are more likely to experience this again during pregnancy or postpartum. Why add one more thing to the list? In addition, anyone who has a history of disordered eating or eating disorder is especially vulnerable for relapse during big life changes, and I would say pregnancy is one of the biggest life changes anyone could experience. I mean you are going to bring another human into the world. Which leads me to another downside of focusing on weight during pregnancy. It can lead to disconnecting from what your body really needs, separating your from your innate connection to your body. If you are concerned that you have gained too much weight you may start trying to control your weight with certain types of exercise or dietary changes. Pregnancy is a crucial time in ones life to truly connect to the body and listen to what it has to say in regards to nutrition and movement. Your body is wise, if you listen it can tell you what types of movement make you feel your best and when and what you need to nourish yourself. I personally found that my cravings and patterns of eating changed significantly from pre pregnancy to the first trimester and then again as I have now moved into the second trimester. If I wasn’t listening to my body, I may have missed out on the cues that led to a really smooth pregnancy so far. Movement needs change too. From fatigue, to needing to pee all the time, to round ligament pain and the hormone relaxin running through your body, what feels good and what is safe and healthy for you will change throughout pregnancy. If you are too focused on the number and controlling the number you may miss out on all the innate cues that your body is giving you. I also have to take a minute to mention the RIDICULOUS amount of pressure on women to gain very little weight, have a “belly only” pregnancy, and/or quickly get their bodies back post pregnancy. In the mix of all of this, I highly recommend just forgetting the number all together and doing what feels best for you. So then what do you do if you decide you don’t want to know your weight during your pregnancy journey? Talk with your medical providers. Share why it is important to you to avoid knowing your weight or talking about weight changes throughout your pregnancy. Depending on your medical care/providers there may be different ways to handle getting your weight taken without you knowing. You may be able to step on the scale backwards. I am currently going through a centering program at a birthing center where they ask us our weight; since I am committed to not knowing my own, my husband has graciously agreed to take my blind weight and share the information with my midwives. There are absolutely options so check it out with your providers to see the best option for you. Note: if you are in a big medical system and mention it one time to a provider that you don’t want to know your weight that doesn’t mean they are going to remember or that the whole team knows. Therefore, you may need to be diligent by reminding providers to weigh you backwards so that you don’t see the number, not share any paperwork or verbal report of your weight, and not discuss weight trends unless there is a severe medical risk. Remember you have the right to protect yourself by not discussing or seeing your weight during pregnancy, and you can change your mind if you have started your pregnancy seeing your weight and wish to discontinue. If you would like more info on how to stay in touch with your body throughout your pregnancy follow me on insta @nom_nomaste.llc. I’m excited to share all the nitty gritty of what I uncovered, learned, discovered, and wish I hadn’t seen about IAEDP 2019!! This one is for all of my fellow eating disorder treatment providers who did or didn’t get to attend this year’s IAEDP conference. Chevese Turner, Amy Pershing and Carmen Cool: Needed to be a keynote! Their discussion of eating disorders for those at higher weights was flawless. After the rest of the conference, I also realized how badly the entire attendee population could have strongly benefited from hearing the Health at Every Size message. Learning all about Telehealth was extremely informative and helped me see that I can always learn more, especially when it comes to technology! It was extremely inspiring and hopeful to see the outcomes of Eating Recovery Center’s Telehealth intensive outpatient program. We need resources for so many that don’t have easy access to specialists and this is a huge step for the field. Emotion Focused Family Therapy is likely going to be my new jam after Adele Lafrance gave a stunning presentation, that reminded us all how parents/caregivers need to be involved and do have the ability to be some of our clients greatest supports. Can you be Vegan and in recovery? The research is bleak, but the presentation from Tammy Beasley and Melanie Rogers made us all think. My take away, this is never black and white as it rarely ever is in the eating disorder field. There may be a potential for individuals to be vegan and recovered, and clinicians need to sharpen their assessment skills, and drop some of the presumptions and judgment when supporting a client who presents with the desire to be vegan. A conference of professionals who support the recovery of individuals with eating disorders seems to have a lot of its own fat phobia baked right in. Several presentations are still using different treatment planning for those with different body sizes, and the assumption that those with anorexia are in small bodies and those that binge are in large bodies was pervasive. More than one presenter outwardly said that pursuing dieting for weight loss, health, or to look better was good as long as it didn’t go to far (straight up face palm). Oh and for an inclusive organization can we address how the chairs were tiny and locked together in most rooms giving no ability to adjust them to allow space for people in larger bodies. We keep getting the message that our field needs to be more diverse and then we limit the access or comfort to individuals who may not fit a very, very small percentage of the population. Can I just say that I FREAKING LOVE eating disorder professionals? So many legends and new clinicians in one space for 4 days sharing, learning and laughing, all with a side of reinforced judgment free zone. I will attend IAEDP again for the company alone. Shout out to Alsana, Rosewood, and Avalon Hills for some fancy meals and great conversation. Nice big rooms and bathrooms, friendly staff, and the scenery was gorgeous. Bonus!! They had flamingos!!! 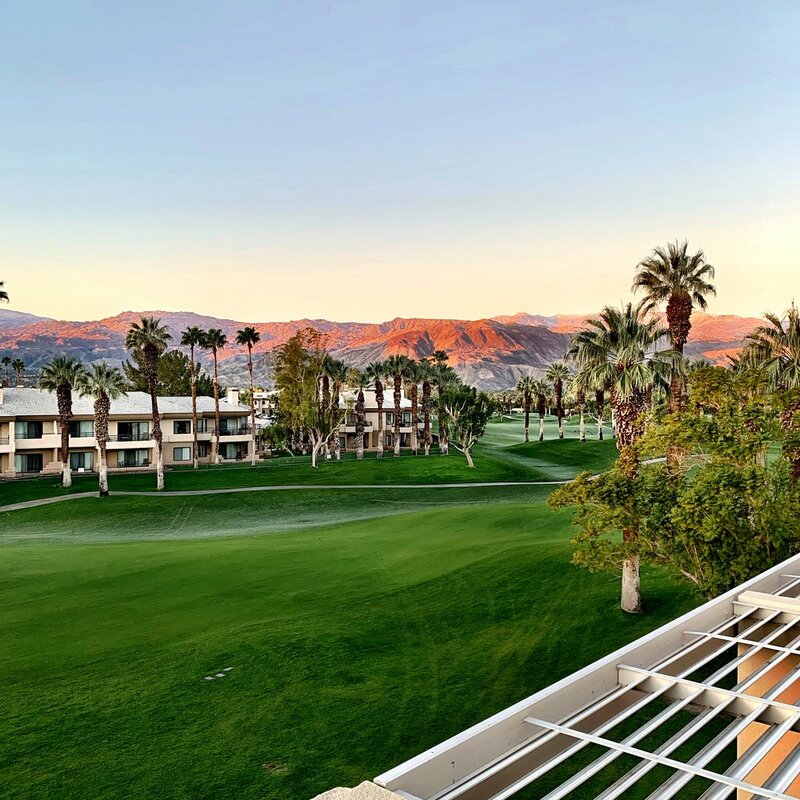 Cheers to 2019 IAEDP – and official request to consider having the conference in TEXAS one year instead of always the east or west coast! My summer interns are all gone, and I’m finally back in the grove of life without them :( miss you guys!!! And this means I’m also back to writing my own blogs :)!!! Today we are diving into sneaky wellness culture and how a focus on healthy eating may not actually be that healthy for us. Let’s face it; it can be extremely overwhelming to figure out what to eat when everything you read has different messages about food, nutrition, and health. There is always some new article or blog about what you “should and shouldn’t” put in your mouth, the health trend of the week, the trendy super food, and the newest list of demonized foods that are going to cause “x or y” to happen to you. It’s pretty overwhelming if you ask me. I want to take a minute to point out that if you feel like you fit the above obsession, it is NOT your fault. 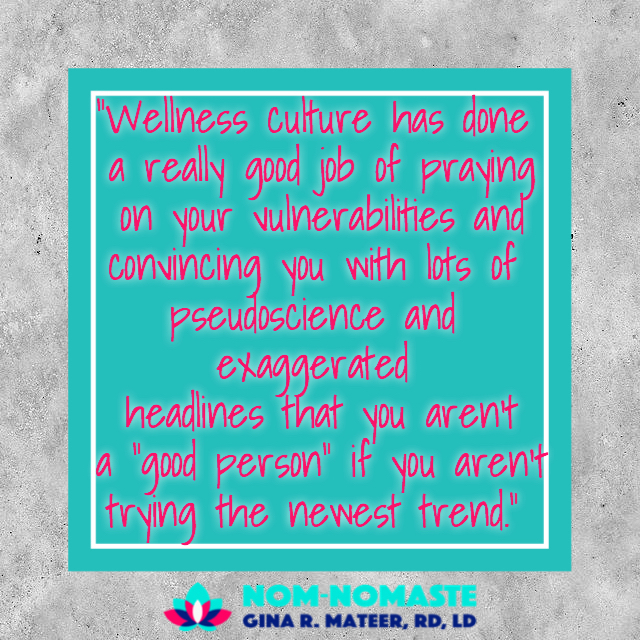 Wellness culture has done a really good job at praying on your vulnerabilities and convincing you with lots of pseudoscience and exaggerated headlines that you aren’t a “good person” if you aren’t trying the newest trend. So what’s the problem with wanting to live your best life? Well the issue is obsessing about health tends to create more problems and leave you feeling anything but your best!! General well being is much more than just the food we put in our bodies. Overall health is affected by a myriad of different factors including stress, sleep, nutrition, activity, and social connectedness. Food and nutrition is one small piece of the overall health pie. It’s effect on health is often over exaggerated, and we tend to focus on food with the exclusion of the other areas. When focusing on food goes too far several negative effects can start to bubble up. It may start small like feeling some general anxiety about food choices, thinking about food and health more often and limiting food choices, but this can spiral into bigger issues like preoccupation with food, limited social engagement, nutritional deficiencies and eating disorders. You don’t have to drink green juice, take lots of supplements and eat smoothie bowls all day to be healthy! (and I’m not saying there is anything wrong with these foods if you do like them and they are one way that you get your nutritional needs met) Instead of hyper focusing on individual nutrients and avoiding or cutting out foods, you can come a long way to making peace with food by looking at the whole picture, including a variety of food and remembering that nutrition is just one piece of the health pie! If you feel like you could benefit from some additional support unpacking wellness and diet culture and making peace with food make an appointment today! And follow me over on Insta for more food peace and body love. Anna Marie is here for her final blog of her dietetic internship!!! Big shout out to all the effort she has put into this rotation and good luck on your upcoming exam!! Thin = healthy is a commonly believed “fact” in our current culture. Body Respect is a book that challenges this belief. Body size does not define health. Someone in a larger body can be healthy, just as someone in a smaller body can be unhealthy. This book is eye opening and enlightening for anyone recovering from an eating disorder or a history of disordered eating. It’s also informative for any and all healthcare professionals, students, or the public in general. It goes into the problems we’ve created as a society by buying into the myth that the only good body is a thin or small body. The book is divided into 4 sections: deconstructing weight, reconstructing respect, self-care, and cultivating body respect. In my opinion, this section is the most important. It goes into detail about the common beliefs that “thin people [are] attractive, desirable, and healthy”, and “weight is controllable by diet and exercise and fat causes people to get sick and die early” (Bacon, 2014). Then, it shows why these assumptions are completely false. It goes on to debunk several health myths. My favorite myth it debunks is that we have evidence that weight loss improves health. Lots of research studies have been completed that show improvements in health outcomes (i.e. improved diabetes management, lowered blood pressure, etc.) as a result of weight loss. However, “in all of these studies, the participants are doing something to achieve the weight loss, usually changing their diet or exercise habits. Both of these have been shown to improve health independent of weight loss” (Bacon, 2014). Creating healthful habits, independent of weight loss, can improve health incomes. As a society, we neglect this because we only see someone as successful at managing their health if they lose weight and maintain weight loss. The key message here is not that every person in a larger body is healthy, but that they can be. We should not assume that just because someone is larger they are not healthy. Every body should be treated with respect and be supported in engaging in healthy behaviors, even if weight loss does not result. In Linda Bacon’s Health at Every Size (HAES) research, two groups of “obese” women were compared. One group was on a typical diet/weight loss program and the other group was on a HAES program that promoted body acceptance and listening to internal hunger/fullness cues. By the end of the two-year program, almost half of the diet group dropped out, which is typical of most weight loss research studies. The HAES group showed “improvements in blood pressure, total cholesterol, LDL, and depression” (Bacon, 2014). What’s even more astounding is that 92% of the HAES group participants stuck with the program until the end. Most diet/weight loss studies have a high dropout rate, but participants who were educated on HAES principles and implemented them into their lives not only stuck with the program but also showed health improvements, independent of weight loss. After establishing the research, the book goes into practical ways to apply HAES principles into your life, such as accept your body, eat to appetite, engage in joyful movement, use nutrition information as a tool, and rest often. Intuitive eating concepts are explained concisely, highlighting that listening to your body is key. Eating what the body wants in the amounts that the body is asking for is encouraged. The macronutrients (carbohydrate, protein, and fat) and their essential functions are described in greater detail. Being active and engaging in joyful movement are crucial components of HAES. Instead of only engaging in militant exercise, this approach adopts movement that is fun and enjoyable. Movement is a normal part of healthy living, regardless of the minutes worked or calories burned. The focus should be on enjoyment, not body change. This is not to say you should not exercise. Exercise in ways that are enjoyable. If you enjoy running, go for a run. If you enjoy yoga, take a yoga class. Exercise should be pleasurable, not punishment. Body respect is all about loving the body you’re in right now. Regardless of whether a “well-intentioned” friend, family member, or medical professional tells you to change your weight, you should love and respect your body. Making peace and respecting the body you’re in, rather than making “lifestyle changes” in the pursuit of changing your appearance, is the path to true health. Bacon, L., & Aphramor, L. (2014). Body respect: What conventional health books get wrong, leave out, and just plain fail to understand about weight. Dallas, TX: BenBella Books. Bacon, L. (2010). Health at every size the surprising truth about your weight. Dallas: Benbella Books. For more from Anna Marie - follow her on insta! Summer interns for the win!! Anna Marie Oglesbee is at it again - this time she is looking at the evidence behind the "setpoint" theory. And exploring more about what determines our natural weight ranges. Your setpoint weight is the weight that your body (not your mind) decides is appropriate for you. It is “the weight range that your body likes best” (Bacon, 2014). This concept is not commonly discussed in healthcare settings because it challenges the common belief that if you eat less and move more, you WILL lose weight. The concept of setpoint weight challenges this belief and holds the truth that your body knows exactly what size it should be and exactly how much fuel you need to maintain this size. Your body is like a thermostat. Imagine being outside all afternoon for a daytime concert. In the Texas heat, your body will naturally begin to sweat to cool you off. When you step inside to a nice air-conditioned room, you stop sweating and you begin to cool down. The body is very good at maintaining temperature. Our weight works the same. If we listen to our internal hunger/fullness cues and eat according to these signals, our weight will stay within our setpoint range, which can change throughout life (Friedman, 2004). There is no need to count calories, grams, points, etc. to stay within a certain range. Our bodies simply do this for us. When we ignore our body’s internal hunger/fullness signals by following a strict set of rules (i.e. a diet), we may lose weight initially. However there is evidence that diets don’t work so when we inevitably begin to eat “normally” again, the pounds will come back. We usually gain back more than we lost because our body is storing up for the next “famine.” In prehistoric/hunter-gatherer times, we ate what was around. If no one was able to catch food or vegetables were not ready for harvest, one simply did not eat. It was normal to go for several hours, or even days without food. When one finally got food, they ate what they could. As a survival mechanism, the body would store the extra fuel (i.e. metabolism would slow down) so that the person would survive longer during the next period of starvation. Restriction, followed by a period of “normal” or “over-eating” raises the setpoint because the body is unsure when it will get fuel again. This was useful survival mechanism during prehistoric times, and even today it’s a sign of our body doing it’s best to survive. This is why “yo-yo dieters” usually gain more and more weight with each diet attempt. Restriction followed by an increase in fuel (either through over-eating or “normal” eating) raises your setpoint. · overeat since you’ve already blown it today (Bacon, 2010). · are disconnected from hunger cues all together. Bodies are designed to come in different shapes and sizes. A healthy weight for one person may be radically different than for another person. Our culture fixates on a “thin ideal”, but this “thin body” is not actually healthy for most people. The only way to find your true setpoint weight range is by healing your relationship with food and your body, allowing yourself to eat intuitively. *If you are concerned that you are not at your setpoint weight due to an eating disorder, negative relationship with food, or chronic dieting, please see a Registered Dietitian specializing in eating disorders. And check out Nom-Nomaste for more body positive realness! Anna Marie is back at it this week addressing one of the biggest recent questions in nutrition - is food addictive? She delves into the research to share that food addiction is bunk (at least in our opinion over here at Nom-Nomaste!) but don't take my word for it- read on!!! Addiction can be medically defined as “a compulsive need for and use of a habit-forming substance characterized by tolerance and well-defined symptoms upon withdrawal” (Merriam-Webster, 2018). Based on this definition, it seems logically impossible that one could be addicted to food because one cannot cold-turkey stop eating. Although it is possible to cut out a food group, no well-trained dietitian or nutrition professional would recommend this because of the toll it would take on the body. Before deciding that you must be addicted to food, let’s take a look at the research behind food addiction. The concept of food addiction has “very little supporting evidence” (Ziauddeen, 2013). Food, unlike drugs or alcohol, does not have a pharmacological action, so addiction cannot be measured in the same way as substance abuse or alcoholism. The Yale Food Addiction Scale (YFAS) is a self-reported 25 statement questionnaire based on criteria for substance dependence (Long, 2015). Although this questionnaire is widely accepted, more than half of the statements on the questionnaire could be reflective of chronic dieting, not addiction. For example, the first question states “I find that when I start eating certain foods, I end up eating much more than planned”. This statement is more reflective of someone who has dieted repeatedly in the past (deprivation mindset, i.e. “I better eat it now, since I won’t get it again”) than someone with an addiction. One important thing the YFAS scale does not take into account is previous dieting history. Biologically, when one restricts a certain food, the deprivation effect kicks in leading to feeling out of control around this food. This is not addiction, it’s simple biology. Think about it like this: you’re on a long road trip with very few convenient stops. You drink a large amount of water and have to go to the bathroom. How much more are you thinking about how good it would feel to just go to the bathroom? You wait much longer than you should, and you are uncomfortable. When you finally get to a rest stop, how much longer does it take you to use the bathroom and get rid of the excess water? The same thing happens when you deprive yourself of a certain food for a long time. You have increased food preoccupation, and when you finally eat the restricted food, you have a much more than you would have had if you honored the initial craving for the food. This is not an effect of addiction; it’s a normal byproduct of continual restriction. Are you hard on yourself for having to go to the bathroom? Why should you beat yourself up for wanting what you’ve deprived yourself of? One study followed 56 participants on a restrictive weight-loss diet. The participants were provided chocolate snacks for a week to establish a baseline, then restricted for three weeks. After the three-week period, they ate more chocolate than at baseline. The deprivation of chocolate led to “an increase in consumption post-deprivation in restrained eaters” (Keeler, 2015). These participants were not addicted to chocolate. They simply wanted it more since they had been deprived. When a certain food is “forbidden” or restricted, thoughts of and preoccupations with this food increase. When the food is finally temporarily allowed, the “last supper mentality” sets in and causes over-eating. The mindset of “I better eat it now because I’ll never have it again” takes over and leads to over-eating. This is not addiction, it’s simply the deprivation effect and is the result of chronic dieting/restricting. Higher BMI and the presence of binge eating are strongly associated with a positive YFAS score, but correlation does not always mean causation (Long, 2015). Although binge eating is associated with higher BMI, not everyone with a higher BMI engages in binge behaviors, and not everyone who binges has a higher BMI (Ziauddeen, 2013). As mentioned before, the YFAS does not take into account chronic dieting. “Restrained eating often leads to loss of control, bingeing, and counterproductive weight gain” (Carr, 2011). Restriction (not addiction) leads to binges. If you think you are addicted to a food (or all foods) because you cannot stop eating when you allow yourself to have “just one bite”, ask yourself if it’s something you’ve ever restricted before. Even if you restricted a food 30 years ago, you can still have the deprivation mindset if you still (intentionally or unintentionally) label the food as “bad” or “unhealthy”. Cutting out the food that you are “addicted to” is not the answer. A common misconception is that since you cannot stop eating a certain food, you must cut it out completely to eliminate the temptation. This only makes the temptation stronger. The reason you feel so out of control is because you’ve restricted this food in the past. The deprivation effect is not the same as food addiction. Even though some people may score higher on the YFAS scale, a scale cannot “measure a behavior and validate a pathophysiological process to underlie that behavior” (Zaiuddeen, 2013). No existing research supports the theory of food addiction, however, higher YFAS scores are seen in individuals with binge eating behaviors and people who have been unsuccessful in controlling their weight (Long, 2015). Food addiction is not probable, according to the research. The only way to get over the deprivation effect is to give yourself unconditional permission to eat. Many people think that with unconditional permission, they will definitely over-do it. While this may be true initially, once you realize you can have the food you have been restricting yourself from any time, it loses its alluring effect. For example, if you’ve avoided candy at all costs for over a year because you believe you are addicted to sugar, at first you may over-do it and have a few sugar crashes. Once you realize the candy is there whenever you want it and it will be there tomorrow, you may want less today. The key is time. Undoing the deprivation effect is a process and does not happen overnight. Giving yourself unconditional permission to eat all foods is the only to end deprivation mentality. I completely scored this summer with 2 awesome interns from the University of Texas. Anna Marie is wrapping up her specialty intern rotations by fully diving in to all things Eating Disorders and she has lots to share about what she wishes she would have learned while in her dietetic program. As I am finishing the last few weeks in my dietetic internship to become a registered dietitian, I am reflecting on my work as a student and realizing there are a lot of things in the real world that my education did not prepare me for. As a disclaimer, I am not bashing on the University of Texas or our RD training program (the Coordinated Program in Dietetics). I learned a lot about nutrition and science and I am very grateful for my science-focused background. I know a lot more about metabolic processes and the science of food and digestion than I ever thought possible, and I definitely think this knowledge will make me a better dietitian. However, I am realizing now that there is a lot I did not learn in school that I will be using in practice. I wish my education at least touched on the principles of Health at Every Size®. I’m not saying it should be required reading for a class (although this would not be a bad idea), but at least educate us on how to work with people in all bodies in a non-stigmatizing way. Just like most (if not all) healthcare professions, our education is extremely weight-biased and is rooted in the assumption that people in larger bodies need to and should want to lose weight. More than two thirds of Americans are “overweight” or “obese” by BMI standards and the stigmatization in the healthcare industry is preventing these people from getting quality care. For example, let’s say a person in a larger body has diabetes, but it is well controlled by balanced meals and regular movement. This person may feel their diabetes is in control so there is no point in seeing their endocrinologist because the doctor will only tell them to lose weight. They delay seeking care and go to see a PCP five years later when they are feeling sick. The doctor runs some tests and they discover the patient has stage 4 pancreatic cancer. If they would have seen the endocrinologist regularly, the cancer could have been detected and treated sooner. Fear of weight stigma kept this individual out of the doctor’s office and was in the end worse for their health. We are taught that “one pound equals “X” calories so a caloric deficit of “X” calories a day for one week should result in weight loss of “X” pounds a week.” This would be great if it were actually true. When we give our patients or clients this advice (or follow it ourselves), it only leads to obsessive counting and measuring only to be disappointed by the end of the week when we are hungry and not losing weight. The concept of treating an individual from the perspective of “calories in = calories out” is total BS. When I discovered intuitive eating for myself, everything changed. I had a light bulb moment when I realized that my body is really smart and will tell me exactly what, when, and how much to eat with little control from me. All I have to do is listen. In class, they taught us how to calculate our calorie needs using lots of different equations and activity factors. In a clinical setting, this is extremely useful for patients in critical condition or patients who are so sick they have appetite loss or other issues. For the average person, this can cause more harm than good. When I learned how to calculate my calorie needs based on my height, weight, age, and gender, I used that as a rule to “only eat this many calories or gain weight.” Obsessive counting, measuring, and logging to stay within a calorie goal, even in the pursuit of “health” is not healthy. Listening to your body and responding accordingly to hunger/fullness cues is the way to make peace with food and honor your health. I have learned a lot this summer by working with Gina at Nom-Nomaste, LLC and another private practice that works with eating disorders, but we do not learn enough in school. In my entire 4-year degree in nutrition, we spent 50 minutes in one class talking about eating disorders! There’s so much to learn that one 3 credit hour semester long course probably wouldn’t be able to cover it all. In that 50 minutes, we learned the basic diagnostic criteria for the most common eating disorders but not how to work with this population. This summer, I have learned that there is so much more to it than the desire to be thin. Mental and behavioral aspects play a large role, and we are not properly trained to work with this population. As dietitians, we are going to see eating disorders in any setting we are in, so it is shocking to me that we do not learn more. This lack of education can be harmful to the people we are trying to help. Although I wish I learned these things, I do believe my education (and especially my dietetic internship) prepared me to be the best dietitian I can be. I am excited to start my journey as a Registered Dietitian in a few short weeks! Okay guys I'm literally in tears (partly b/c the greek restaurant I am typing this in is cooking some super strong onions right now) but mostly because this is my awesome intern, Zoe Halbert's, last week with Nom-Nomaste! To wrap up she decided to do one last blog post. Let’s face it! Diet culture is everywhere; including social media, the grocery store, the gym, magazines, televisions, and even in schools. It can seem impossible to get away from the diet mentality that surrounds us. As you are on your journey to making peace with food, how is it possible to ditch diet culture for good? It may be difficult to get away from diet culture 100%, but there are some things you can try to reduce its influence on your own life. Who you spend time with matters. Recognize the people in your life that share your values and support you as you work towards having a healthy relationship with body image and food. Connect with others walking the same path via social media. There may still be people in your life that are not as supportive or have their own negative relationship with food, but having some support will help on your journey. Diet talk is so acceptable in our society and it can be difficult not to get sucked in. When it does come up, try to shift the conversation. For example, if your friend says she is trying to lose weight for her next vacation, redirect the conversation by asking her where she is going and what she plans to do there. If someone you spend a lot of time with continues to bring up diet talk you may want to have a conversation with them about how that makes you feel and that you would rather discuss other topics with them. Pay attention to who you are following on Instagram, twitter, or any other social media site. If their posts make you feel any doubt, unworthiness, or negativity about your food choices or body, click unfollow. Find accounts that encourage self-care and body positivity, and that truly are in line with your values. Try to create a feed that displays diversity and true representation of how the world looks. Next time you hear “gluten makes you gain weight,” “carbs are bad for you,” or any other diet myth being perpetuated, take a second, pause, and fact check. Remember that diets don’t work and no food group needs to be taken out of your diet for you to be healthy. It’s easy to fall into the trap of this ideal that the weight loss industry thrives on; just eat this and you will be happy and thin. The truth is, no diet or amount of weight loss leads to self-acceptance or health. Smash it with a sledge hammer, throw it out a window, or just toss it in the trash. Banish the idea that your weight has to be micromanaged. If you can, get rid of anything that reminds you of diet culture whether it be the scale, clothes that don’t fit, or magazines that promote weight loss. Write positive affirmations somewhere you will see them every day and have reminders of how amazing you are and to be gentle with yourself. Make your living space a diet culture free zone. Self-care means doing what is best for you and your overall health. Some days it’s moving your body in a joyful way, others it’s eating cake with someone you love, and sometimes it may mean taking a bubble bath. Basically, it looks a little different everyday depending on what your needs are (nourishment, sleep, anxiety relief, comfort, accomplishing tasks, connection, personal development etc.). Remember that feeding yourself in a way that nourishes your body, mind, and soul as well as speaking kind words about yourself are acts of self-care. We as individuals may not be able to end diet culture alone, but by cutting it out of our own lives as much as possible, collectively we can begin to shift the future towards a culture of self-love and body positivity. For more on ditching diet culture follow Nom-Nomaste on Insta! And check out more from Zoe here!